Since 2009 Kling & Bang Galleri from Reykjavik have been building an archive of DVDs. This June they will bring a selection from this archive to Dorothea Schlueter. The archive is compiled by the gallery out of the many projects, exhibitions and collaborations that Kling & Bang undertake, not only in their roles as hosts and curators, but also as artists in their own right. The archive contains artists’ films, videos and animations, as well as documentations of performances and much more. Amongst others, the work shown in Dorothea Schlueter will include Kling & Bang members and associates Hannes Lárusson, Ásdís Sif Gunnarsdóttir, Sigurdur Gudjónsson, Kolbeinn Hugi Höskuldsson, Lilja Birgisdóttir, Inga Birgisdóttir, Monika Frycova, Hekla Dögg Jónsdóttir and Erling Klingenberg. The Kling & Bang gallery was founded by a rag tag group of artists at the beginning of 2003. Coming from a variety of different backgrounds, the group’s common goal was to challenge the context and content of creative thinking. 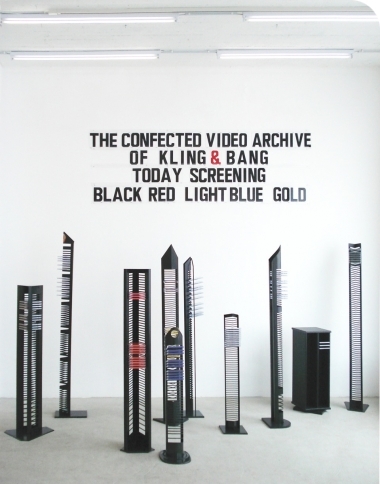 And throughout the seven years of Kling & Bang’s existence this enthusiasm has been responsible for countless projects, exhibitions and collaborations. Of course there will be variability in terms of quality, there always is, and while too much focus may rest on the “how” and only later on the “what” this “modus operandi” has stood Kling & Bang in good stead and brought them international attention. Since 2003 they have presented work by carefully-chosen, emerging and established artists, both Icelandic and international. They have participated in a show at the Pompidou Centre in Paris, at the Berliner Liste in Berlin and at Frieze Project Frieze Art Fair in London and collaborated with such distinguished international figures as Christoph Schlingensief, Paul McCarthy, Jason Rhoades, John Bock, David Askevold, Gelitin, as well as working with a number of influential Icelandic artists. For two years, they ran the 5,000-square-meter KlinK & BanK studio space, where some 137 artists, designers, filmmakers and musicians worked on a day-to-day basis, producing wide variety of projects, presenting on average three events per week. As the artist-run element of the organization is vital to the group’s identity, all eight of Kling & Bang’s members are artists themselves — indeed, when applicable, the gallery volunteers to participate in the creation of artworks with the artists they invite and exhibit. Kling & Bang puts up close to a dozen exhibitions every year and they are down-and-dirty, they’re hands-on and above all “can-do”.